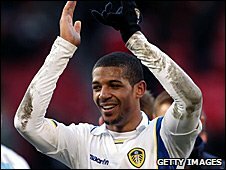 Leeds striker Jermaine Beckford has withdrawn his transfer request and says he will stay at the League One leaders until the end of the season. The 26-year-old, who is out of contract in the summer, has scored 20 goals this season, including the winner in the 1-0 FA Cup win over Manchester United. He told the club website: "I want to finish what I have been striving to do for the last two seasons. "I want to help promote Leeds out of a division they don't belong in." He added: "Every time I put on the Leeds United shirt I give 100% and can assure the fans, the manager and everyone connected with the club that I will continue to do that." Beckford, who will be available to leave on a free transfer in the summer, handed in a transfer request days before the Old Trafford win and had been linked to Newcastle. Manager Simon Grayson added: "I'm keen to draw a line under the situation and now we can all move on together." He has scored 74 goals in 135 appearances for Leeds since joining from Wealdstone in 2006. The former Carlisle and Scunthorpe loanee was also on the transfer list for two months last summer after turning down a new deal.